Maltitol is a low-calorie artificial sweetener. It is a carbohydrate, a sugar alcohol made of glucose and sorbitol . It is produced from maltose, which is derived from the natural starch (wheat, tapioca or corn), by using enzymes alpha- and beta-amylase and pullulanaze [1,2-p.224]. Maltitol is used as a low-calorie sweetener, humectant, thickening agent and texturizer in candies, chocolates, baked goods, ice creams, chewing gums and pan-coated tablets [2-pp 244-246;3]. In the European Union maltitol is labeled as E number E965 . Maltitol is not digested and absorbed in the small intestine so it travel to the large intestine where beneficial intestinal bacteria break it (ferment) into gases and short-chain fatty acids (SCFAs), which may be beneficial for the colonic lining. Maltitol can provide 2.1 kilocalories per gram [2-p.233]. Tooth decay. Maltitol does not promote dental caries [2-p.234;3,8]. Diabetes mellitus. Maltitol has a low glycemic index (GI = 45) [2-p.9], which means it does not significantly raise blood glucose and insulin levels [3,8]. There appears to be no scientific evidence about the weight loss promoting effect of maltitol. Maltitol as a food additive is safe to use, according to The Joint Food and Agriculture Organization/World Health Organization Expert Committee on Food Additives (JECFA) [3,5]. A petition to affirm the GRAS (Generally Recognized as Safe) status of maltitol has been accepted by the US Food and Drug Administration (FDA) , which means maltitol as a food additive is allowed to be used in the U.S.. Maltitol is also allowed in the European Union, Canada and Japan [2-p.247;3]. There is no evidence about cancer promoting effect (carcinogenity) of maltitol or maltitol syrup (polyglycitol) . There appears to be no evidence about maltitol toxicity. In animal (rat) studies, maltitol was not toxic for the fetus . There is lack of human studies about maltitol safety in humans but there also appear to be no evidence of its toxicity for the fetus. Maltitol attracts water from the intestinal wall (osmotic effect) so it can have a laxative effect. Laxation threshold for maltitol in healthy people is about 30 grams in a single dose or 100 grams per day [2-p.237;3]. Maltitol in doses at least 15 g/day is well tolerated by children . Maltitol, when consumed in excess, can cause problems, such as abdominal bloating, pain or cramps, excessive gas (flatulence), loose stools or diarrhea. Maltitol may trigger allergic reaction in sensitive individuals. Yes; it is produced from wheat, tapioca or corn. Maltitol can be produced from wheat, but it should be gluten-free. 3. What is the difference between maltitol, stevia, sucralose and sucrose? Maltitol has about 2 kilocalories per gram, stevia and sucralose have no calories and sucrose has about 4 kilocalories per gram. 4. Is maltitol allowed on candida diet? Maltitol could potentially stimulate the growth of candida yeast, but candida overgrowth in the otherwise healthy individuals has not been proven so far. No. 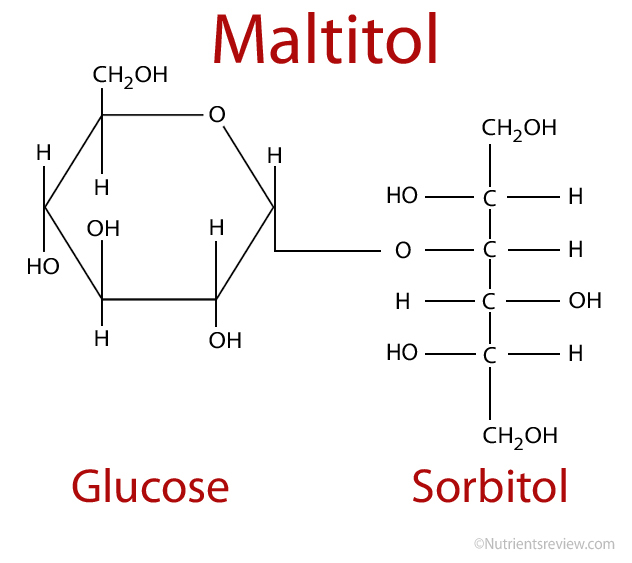 Maltitol is a carbohydrate, not a lipid, so it does not form ketones. 6. Does maltitol cause acne or rash? There appears to be no evidence about maltitol as a cause of acne or rash. 7. Does maltitol causes migraine headache? There appears to be no evidence about maltitol as a specific trigger of migraine. Had a couple sin gluten cookies made in Spain said on the label for coeliac. Was ill with severe stomach cramps and thought had been glutened. Reread labels not heard of maltitol,have now and will avoid. Why do they use suspect stuff in g free we are already extra sensitive. Had a huge reaction to lupin flour found in g free pasta too! Maggie, yes, polyols (maltitol, mannitol, xylitol and sorbitol) in certain amounts can cause bloating, gas and diarrhea. OMG yes maltitol/xylitol/ other “tol” sweeteners, altho excellent no-cal sweeteners, give me the worst cramps/stomachache ever. I am not gluten or celiac but I do need to watch sugar and I do eat it in excess – as in entire pint. I do better with erythritol – still “tol” but much easier on the insides. Sure wish there were more no- or low-sugar products like Artic Zero and Enlightened ice creams. Thrive has sugar free but with maltitol, fine if you can limit yourself to one serving. sugarfreesweetie, erythritol is an exception from this “-tols” because it is well absorbed unlike other “-tolls.” Mind you, except erythritol, other -tols have about 2 Cal/gram, not zero as you might think. If these cause gas, you may also want to avoid “FOS” (fructooligosaccharides or oligofructose), inulin, fructose and maybe lactose. Adjusted my diet to be more sugar and calorie aware…had most awful cramps and abdominal pain after consuming Maltitol. It can’t be good for you if it causes such severe pain. Best now just to have no sugar and no sugar alternatives. Try Splenda (generic sucralose). No bad side effects. Zero calories. Diet Pepsi uses it now instead of aspartame. I use in cereal, hot cocoa, baking, and love it. It’s a godsend for those on sugar-restricted diets. I don’t know why Hershey still uses maltitol. Must be a half cent cheaper than sucralose per tablespoon. I see the superscript numbers here and assume they relate to citations, but I don’t see a list of the sources themselves. Am I missing something? You need to click on “references” at the bottom of the article. I became super bloated, flatulent & experienced terrible diarrhea after ingesting Atkins bars. Did not at first realize that was the source until the third day of misery. I checked the ingredients and googled maltitol. WOW, cannot believe that Atkins would put that ingredient into their bars. Needless to say, I threw out the remaining bars and will NEVER again purchase the product. Maltitol should be taken off the market! Agreed (about the maltitol). Atkins does make a bar that uses Splenda rather than maltitol. I can’t recall the specific name of their bar but you can find it by reading the ingredients. You might call them as an alternative to searching through their many bars on the shelves. I have read that they are phasing out maltitol. Why, why, can’t companies like Hershey use a non-caloric sweetener like sucralose (Splenda) instead of maltitol that has substantial calories and causes abdominal cramps and other unpleasant gastrointestinal problems in many people? Also why can’t Hershey make a Sucralose-sweetened chocolate candy bar? Use a healthful unsaturated fat in it (not butter, etc.) They could make millions off of it.